This is one of the places that I have enjoyed the most. This is in Bangalore city, India. 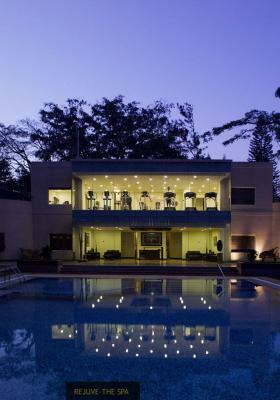 It is located at the Grand Ashok, Bangalore. It promises to renew our senses with a unique variety of Indian, European and oriental healing treatments.It is a very stress free and relaxing place.That is one of the main things required for a baby moon holiday. It blends the east and the west principles of healing techniques. I think it is one of the top 10 spas in the world. I and my husband had a great time there. They have around seven therapy rooms and two beauty parlors along with a hydrotherapy facility, a fitness centre and swimming pool. Their food is also fabulous where they offer a health cuisine of a low-fat, low sodium and high fiber diet. I think this type of food is the best for a would be mother. They also provide a rejuvenation cuisine for the guests according to their body composition and requirements so they can re-vitalize their body and soul. We also had a variety of hydrotherapies to select from. There is a crystal-gem therapy which they recommended but we could not try that. Their western and ayurveda massage therapists have a great knowledge and experience in their field. It seems they undergo extensive and vigorous training at their in house training centre. For a total wellness experience there is yoga classes at sun rise and meditation classes sunset. The aerobics classes are also very beneficial. The spa offers a unique approach of offering lifestyle assistance by understanding the concepts of natural healing, nutrition concepts and fitness options to give you optimal well-being. I think like me you will also enjoy the treatment there.